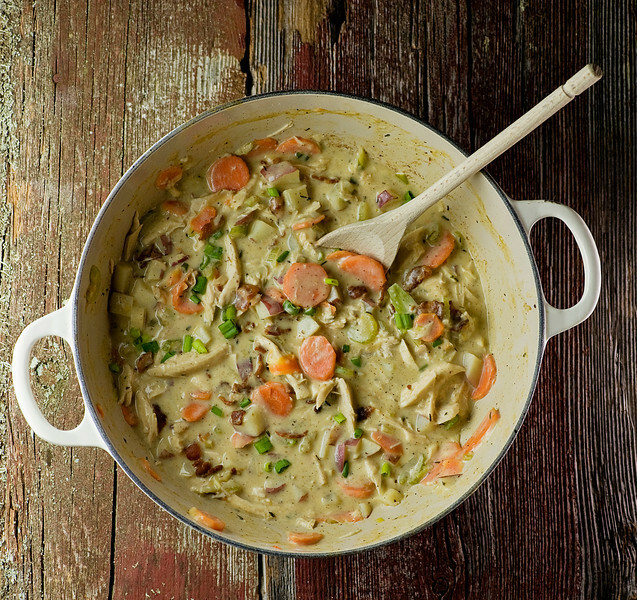 Creamy chicken stew is full of carrots, celery, potatoes…and bacon! The ultimate comfort food, all in one pot. Welcome to comfort food heaven! Oh, this chicken dinner. It’s somewhere in between a stew and a soup…it’s thicker than a soup for sure, and even though I’m calling it a stew, all that delectable creamy sauce up there makes it a little more soup-like than your typical stew. Let’s just put it this way: you are going to want both a fork AND a spoon to scoop up every single drop and morsel. Because this is delectable, warm and wonderful wintertime comfort food at its most comforting. Let’s make some!Now, one of the things I love about this recipe is that it is a great way to use up leftover roast chicken. (And this is the perfect place to tell you again about my all-time favorite roast chicken recipe from the the fabulous Leite’s Culinaria. Click here for the only roast chicken recipe you will ever need. Serious yum.) If you don’t happen to have leftover roast chicken hanging around, it’s perfectly fine to pick up one of those roasted chickens in the supermarket…they will work just fine here. Now, one of the things that makes this recipe so heavenly is that you are going to both start off and finish it with bacon. You cook up some chopped bacon until it is nice and crispy, and then scoop it out…but leave the drippings in there. Now toss in your veggies and cook them just until they are tender and perfect. All that’s left to do now is to add some broth and a little half and half to the pot to make that delectable sauce and simmer some chopped potatoes and a little later your shredded chicken until everything is warm and tender. This is going to take about 15 minutes all told, and that sauce is going to cook down to that secret and wonderful place between soup and stew. Here’s a quick video that will show you just how amazingly easy this is to put together. Now spoon it out, and spend the next little while thinking that it really doesn’t matter whether it is a soup or a stew…as long as it tastes so dang good! Cook bacon in a large Dutch oven or other heavy pot until crisp. Remove with slotted spoon and set aside, leaving the bacon drippings in the pot. Add onion, carrots, celery, salt and thyme and cook over medium heat until the vegetables soften, about 5 minutes. Add flour, stir and cook another 2 minutes. Add broth and potatoes and bring to a simmer. Cook for about 10 minutes or until potatoes are done. Add chicken and half and half and simmer another 5 minutes. Taste and add salt and pepper as needed. Stir in cooked bacon and scallions and serve. This will be a must try:-)…just used leftover chicken but it won’t be long! This one goes into my file right away ! This reminds me of pot pie but without all the fuss of making that crust! Awesome in so many ways. Oh wow, must try for our next snowy or chilly day. Looks delicious and I agree it reminds me of a chicken potpie. Yum! I am pinning this one for sure. Hurray and thanks for the pin! Mashed potatoes as a side? Looks fab. Or maybe even spooned OVER the mashed potatoes? Heaven! This looks and sounds yummy. I will try this on a cold night I think it will be perfect. Thanks. What a great Sunday dinner! Warm and wonderful – enjoy!! What is half and half? I am in Australia and many things have differing names between our countries. Hi Steve! It’s a combination of half light cream and half milk. But really, you can be a little flexible with this recipe – mixing regular cream with milk will also work just fine – maybe try more like 2/3 milk and 1/3 cream. Hope this helps! Thanks for that. Going to give it a go with low fat evaporated milk. See me on the pot pie bandwagon, too. ;) Or make it the poultry farmer’s version of Shepherd’s Pie? Or just the way it is. I’m sitting her shivering and, if I hadn’t just used up my leftover chicken, I’d be making it for lunch. Hurray for the pot pie bandwagon – sign me up! Does this go under the chicken category or the bacon category? After all, bacon IS the first ingredient. made it for dinner tonight. loved it! mine was a little on the salty side though (what with the bacon, broth, salt and i roasted some seasoned chicken breasts to make this!) so that’s something to consider and keep an eye on. but another 5 star from the ‘experts’ here at home! thanks again for a keeper and enjoy the rest of your holidays! This is incredibly delicious! I’m making my second batch in as many days! And, I recycled the leftovers from the first batch into a chicken pot pie, with a puff pastry crust. Sooo good! I’m eating this as we speak :) extreamly delicious, it turned out a little more brothy, not sure why (i did double the recipe and thought i did it correctly) But for some reason why i put the flour into the veggies it made little dumplings like chicken and dumplings, even though it may have been by accident i love them and this is one of the BEST soups i have had :)! You are so welcome! I find that on the spot improvisations can make good recipes even better, so hurray for yours! I made this tonight for me and my hubby…it was a hit! We gobbled it up and he even wanted to take leftovers to work for lunch. I used a whole rotisserie chicken and it was a breeze to prepare. I think this would be an excellent pot pie filling also, might try that next time to switch it up…definitely a keeper! Thanks! Ah, NOW I know what to do with left-over roast chicken. Thank you, Kate. I made this tonight and it was delicious! to cut the fat I didn’t use any bacon and I just used a bit of olive oil. Also, I used fat free evaporated milk instead of the cream, it came out perfectly! I found it to be very salty so next time I would cut the salt in half, and there will definitely be a next time! thank you! This looks amazing, even though I am currently living in hot Africa! How many chicken breasts would you say you need for the 3 cups? Hi Joy! I think 2 good sized chicken breast halves would do it. Susan, don’t be sorry – I am grateful for all feedback, no matter what kind! I appreciate your candor, and I’ll see what I can do about the picture. OM Goodness! This was so good! The perfect cold-weather meal. I modified only because I either didn’t have it on hand and seasoned based on my taste. Honestly – you could throw any veggie in this stew, I added squash, some baby frozen peas and mushrooms. I can see myself changing this every time! This is my second time making it, omitted the backn the second time and still was just as delicious! Its becone one of my fiancé’s favorite dishes!! I made this recipe tonight and it was fabulous. It will definitely be a regular at our house. Super easy. I used 100% cream instead of half and half because that’s how we roll. This is the perfect dinner for a cold winter evening. Served with some homemade einkorn bread for a super nutritious meal. Thanks for posting. Christy! I’m so glad you liked it (and glad you went for it on the cream! :)) Stay warm!